Thanks for all the great comments on the last page, it was really illuminating hearing all of your thoughts! I think the most common response was that you guys just have higher expectations from Rana than you do for Luca, who has already proven himself to be sort of… uhhh, burny I guess. I guess we’ll just have to wait and see what kinds of decisions these dumb kids make as time goes on. A new Shingworks tutorial about worldbuilding went up for $5 Patrons, and the supplement worksheet is going up soon… decided to get this page out first instead of finishing that, so that’s my next task after this gets posted. Additionally, the behind-the-scenes art/ comments for this page are up now, with a little background painting trick I use. Last but not least, because I’ve been torn between comics, Patrons of any level can vote here if they have an opinion on whether the 3rd update this week should be a Meek page or a Mare page~ Right now Mare is winning 2:1, but I’ll give readers here a chance to chime in too! I’ll be deciding tomorrow what page to work on and that will be up for you guys to enjoy on Friday. also who’s the disembodied arm in the last panel. I hope it’s a ghost of christmas past. If you actually want to be that sneaky, you should have drawn the comic without the arm. Then replace it with this version when the next comic goes up. 8-bit Theater pulled that one once. Quite effectively. Ooh, good job noticing the arm. Poor Suda, I don’t think he’s long for this world. Luca doesn’t seem like the kind of guy who likes the “power of friendship” speech at the best of times. And now that he’s possessed by a demon… Rana, I think your time will come, whether you like it or not. Just because she isn’t thrilled with her father doesn’t mean she’s renounced the values of her society. That takes longer. I wanted to see the fanarts but…. ‘You’re not authorised to see these tweets.’ Are they private to the public maybe? Oh really? Man… Idk, it’s possible you’re on a block chain somehow and were blocked? I double checked and they both look like public accounts to me, and the posts are still up… you could try signing out and looking again and seeing if that does anything. On the mobile site, at least, it’s a bug that I’ve seen even on public tweets. Seems like if you’re logged in on multiple devices/apps, some of them make Twitter throw a fit. Hard to be sure, though. I just open stuff in a private browser tab. No login, no problem. That is: some apps and browsers can view it, and some error for no reason, even if (or because?) all are logged into the same account. Blocks don’t seem to be a factor. I do read my webcomics in Safari on my iPhone, but I’m not logged into twitter at all. I don’t do twitter, but usually have no problem viewing links to tweets. I want more meek pages :) this is such a sibling pages. Hoo boy, you just had to do that to me didn’t you. If Rana burns someone I’m going to be upset (I’m absolutely pumped for Rana to burn someone). I’ve been plucking on the idea for a long time that Dagre was something that could be inherited, or at least wondering about how physical he and Angora’s grandfather are. Dog I’m very excited to see where things go, no matter what happens. Love panels 1,2,3 (starting top left and going to bottom right). I love this kind of unsaid character conflict. Awesome. Neutral on panel 4. 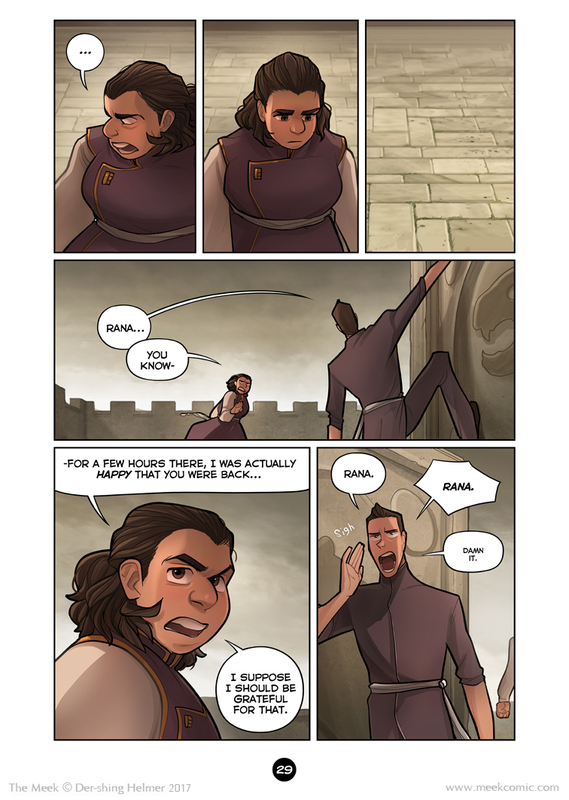 Love Rana’s face in the 5th panel; her face reminds me of her father. The *sigh* in the last panel from Suda looks kind of tagged on; maybe a separate prior panel before to capture that aspect. Mixed feelings on how big sudas mouth is in last panel; on the one hand I love it (emphasis on his bravado), on the other I’m like… It’s just slightly too big…. Don’t know. Leaning towards liking it though. Have I mentioned just have amazing you are at expressions? In the second panel, she’s reverted to her familiar, stoic facade, back to hiding her internal conflict. It’s good that she’s conflicted, though; it means there is hope for her, yet! And just now, looking back at the previous page, I can see the lines under her eyes that I couldn’t before. She’s definitely got a lot more in her head than she’s letting on, and her brother just brought it all to the front. Suda questions the world that makes no sense to him any more, Rana yells it into submission with stubborness. A bit more questions might bring her answers, but I believe she’s afraid that these answers will topple her world further, especially after hearing her parent’s argument (by now, I think she identified with Luca back then more easily than with her mother). Unfortunately, she walks Luca’s way by sticking to her view of the world. Suda is the one ready for change. He’d crossed borders all his life, and in a good way. Now he’s in a situation where there might be only a lesser evil, and he needs to find a good way first of all, or might not be able to find one. But he keeps trying. I love characters like him, they’re way too rare in fiction. Maybe it’s your analytics or adverts? Either way it hijacked the page a few times before I could read it. Just thought you might like to know! Have you considered making your site responsive so it’s easier to read/navigate on mobile? Thanks, it’s an adverts thing. I will let Hiveworks know since it’s an issue on their end. I found out about this comic through a ad on another and at first I was reluctant, the image was of the tiger-demon thing but finally curiosity won and and looked and I am not disappointed. This is a great web comic with good writing, great art and most importantly a compelling narrative. Helmer Keep being excellent you’ve made a reader for life! I am really anticipating the coming Soli chapter. And how this chapter ends. There must be something big coming in the next pages. I am really anticipating in general, is what i’m saying! I stumbled across this by accident a few weeks ago (can’t believe I was too late for the Kickstarter booo :[ ) and I’ve been reading through the archives. It was unsettling to realise I couldn’t click to the next page haha. I guess the biggest compliment I can give is that I’m pretty disappointed I’m up to date now and will have to wait ! Only one thing to do I guess..
/chinhands/ I really love your writing, honestly. I feel like I’d need a few more hours to mull this page over and articulate my thoughts on it, but for now I’ll just say that I find your comics relatable enough to be a little worrying. (I 100% mean that as a compliment.) Really though, my heart just aches for all these characters right now, especially these kids. And Luca, but I may be kind of (very) biased on that end, psht. Either way, thank you so much for making comics. They’re life-changing. Panel 3 feels very abrupt, as though Rana has teleported away, when in panel 4 she hasn’t moved that far. My eyes keep wanting to skip over panel 3. Idk, just the way it registers for me. Anyway, I like the newer look. Very dadly! I doubt she’d appreciate that compliment. I love this webcomic!! OMG I was so happy to see it updated! And it just gets better and better! This is completely out of the blue, but for some reason, my brain decided to give all of Luca’s family Russian accents, so now I can’t stop hearing Suda speaking exactly like Chekhov from Star Trek.